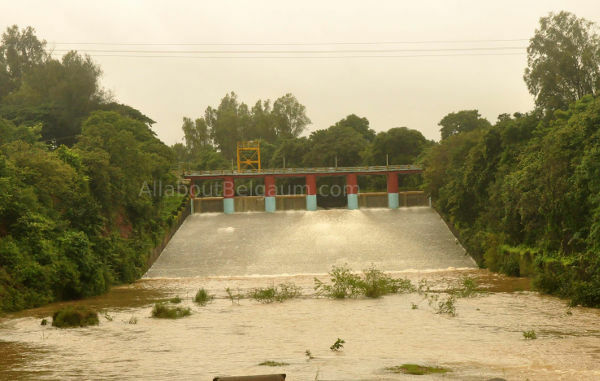 The main source of water for the city of Belagavi the Raksakop reservoir overflowed on 16-07-2018. The current level of water in the reservoir is 2476.75. Both gates have been opened and surplus water is let into the river to maintain level. In 2013 it had overflown on July 22. 18 Kms from Belagavi, literally meaning a hamlet of a Rakkasa (Giant), who is stated to have lived on a hillock near the village. A cavern in laterite on the hillock resembling a huge seated human figure is shown by the people to remind his past existence. Here is a Dam across the river Markandeya, supplying drinking water to Belagavi. The construction of the dam was started in 1960 and completed in 1962. The authorities should look into development of new dams like the ones in savgaon, Khadarwadi n make it bigger. These two dams will help in supply of water in summer too. Even rakaskop dam should be made bigger n proper cleaning should take place as you always see that the rakaskop dam gets filled with water very quickly when it rains. There should also be reservoirs created around kakti or uchgaon thinking from the future aspects of the city. Create small check dams where ever possible. Construct news small dams, we are not expecting big dams. Small dams matter a lot.